Download the 2018 comparative overview in PDF format! Under normal circumstances, companies can provide services in another EU member state without the need to establish a legal entity in the respective country. In order to do that, they can post their employees to carry out services there. Posting of employees, also known as employee secondment, helps to improve business efficiency and deal with temporary gaps in labour market. It should be noted that posted employees differ from EU mobile workers as they are in the EU member state only on temporary basis – to carry out the task required – and they do not integrate in this labour market. According to EU figures, the number of posted employees has increased rapidly in the past years. The number differs significantly based on the sector while it is mostly used in construction and manufacturing sector. EU legal framework on posting of employees is already in place since 1996 (EU Directive No. 96/71/ES) introducing the main rules to guarantee a fair level playing field between companies. In addition, in 2014 the Enforcement Directive (EU Directive No. 2014/67/EU) was approved to strengthen the practical application and cooperation between respective local authorities. The Enforcement Directive introduced by European Commission had to be implemented by the member states by 18 June 2016. The main aim is not only to guarantee the posted employees to be treated equally with local workers in terms of working conditions (such as salary, working hours, breaks etc.) but also to avoid possible social dumping when foreign companies offer lower prices to carry out some work because the average salary in the respective country is lower or other conditions are more favourable in terms of costs. So even if the posted employees are employed by the sending company and therefore are subject of the law applicable in the respective state where the company is seated, they are entitled to have more favourable conditions that are valid in the host member state. 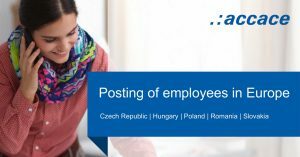 Read more in our 2018 overview “Posting of employees in Europe” and find out how the Enforcement directive has been implemented in the local legislation of the Czech Republic, Hungary, Poland, Romania and Slovakia. Need help? Let’s talk about how we can work together!